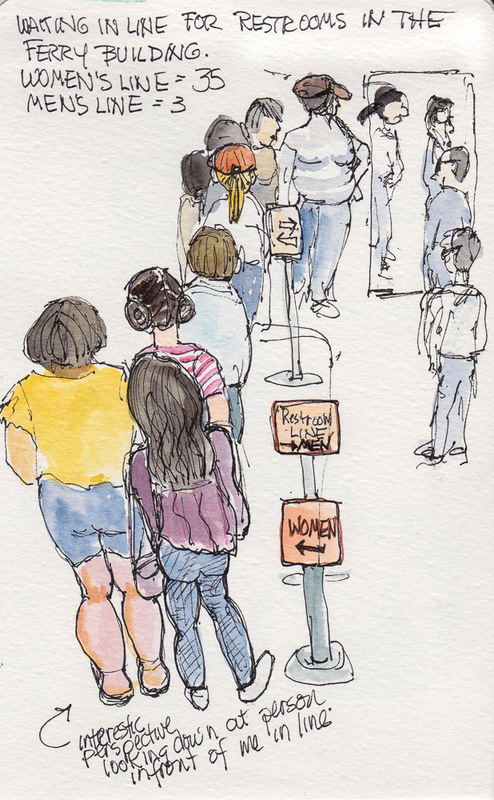 I had a great time at Sketchcrawl 44 on the University of California, Berkeley campus. I missed the starting meet up at 11:00 because I stopped at the entrance to do the sketch above (and to be honest, because I arrived an hour late due to my seeming inability to get out of the house on time in the morning no matter how hard I try). Most of the students are gone for the summer but there were hundreds of visitors from all over the world and families doing campus tours with their high school students and large groups of teens in summer programs on campus. At lunchtime I met up with Cathy and some other sketchers, and had lunch sitting on white chairs set up for a wedding in front of the Faculty Club. 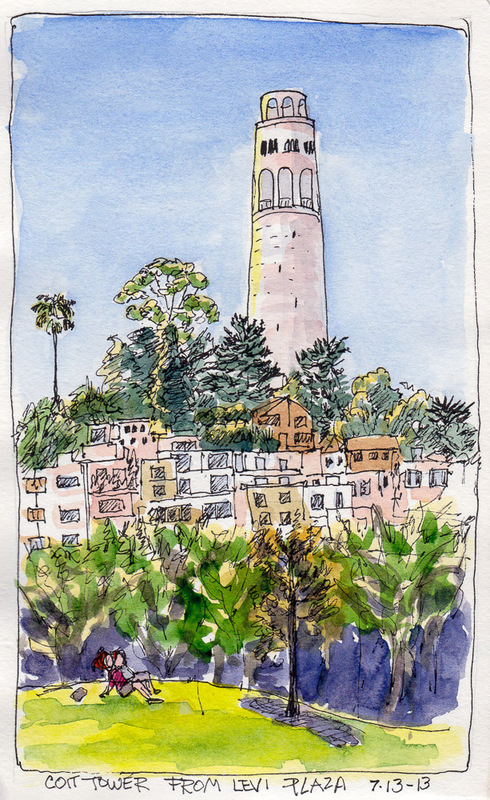 Then I sketched at our meet up spot, Sather Tower, aka “the Campanile,” a tall clock tower in the center of campus. I rode the elevator up to the top and was going to sketch the panoramic view when I noticed someone looking up at the huge bells just over my head. I would have totally missed that sight (until the bells sounded excruciatingly loudly at 2:00 as I was drawing the one bell above). I skipped drawing the panorama since it took so long to understand and draw the bell. Then I took the slow elevator back down and sketched the tower. I only got the top 3/4 in the sketch on the right so added the base with a statue and stairs on the left. At our 3:00 meet up time I was delighted to spot my friends and fellow Urban Sketchers Pete Scully and Gary Amaro. It was such a treat to see them again and get a chance to look through their amazing sketchbooks. I told Pete I wish I could live in the world he draws. I so love the light and depth and detail in his sketches! Gary’s gouache and ink sketch of a campus building is really gorgeous in person. I’ve missed going out sketching all the time like I used to. 2014 so far has been the year of the dog. Unfortunately, having been rescued from the streets of Taiwan, Millie is not fond of urban environments, making urban sketching with her rather difficult. She shivers and shakes on busy streets so much that her teeth chatter. Even though she did get into trouble while I was out (see above) in the hour before the dog sitter came to take her to the park, I’ve really enjoyed the time I spend with her and she’s becoming a great studio dog (see below). If you’re in the Bay Area the weekend of July 12-14, you’re invited to join in the sketching fun. We’ll be meeting Friday evening in Berkeley, all day Saturday in San Francisco and half a day on Sunday at Lake Merritt in Oakland. 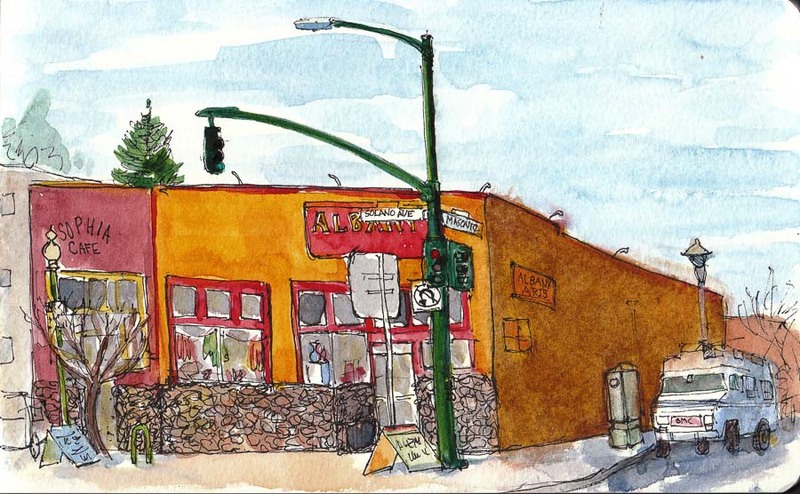 You can find all the details, including schedules and downloadable maps on the 1st West Coast Urban Sketchers’ Sketchcrawl website or Facebook page. Several art supply companies are supporting the event by donating sketching supplies and the local press have interviewed Urban Sketchers and are helping to promote the event with articles and arts and events columns. 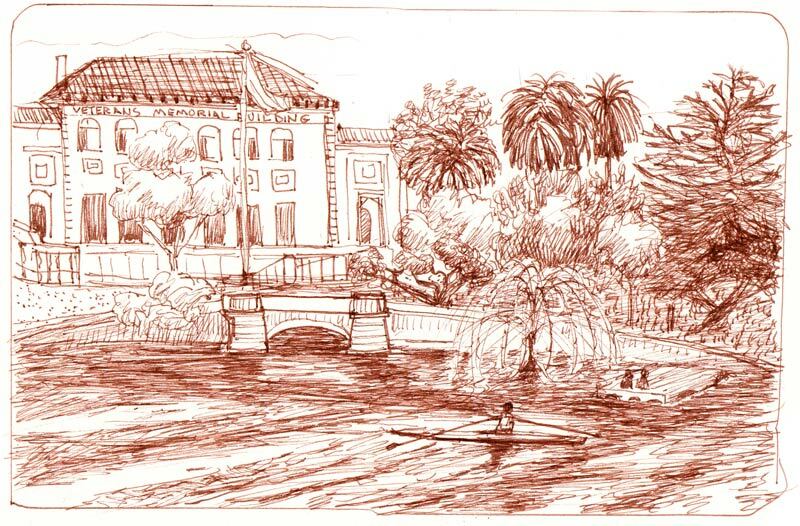 We’re expecting over 100 people each day for this exciting event taking place at the same time as the Urban Sketchers Symposium in Barcelona, Spain and the Worldwide Sketchcrawl. If you’re around this weekend, I hope you can join us. If you’re not, be sure to check out the Worldwide Sketchcrawl site to see if there is a sketchcrawl in your area on Saturday July 13. We had a fantastic time hosting sketchers from around the Bay Area at our sketching event last Saturday. There were at least 30 sketchers and a total of around 100 people who joined us at the reception for the show afterwards. It was great seeing so many local scenes captured in many different styles. You can see photos of the exhibit, the reception and tables of sketchbooks on the library’s blog here. In the sketch above I enjoyed seeing and drawing all the details that normally go unnoticed. Then I disregarded my plan to put the paint down and leave it alone. Instead I repainted the right side of the building several times and even removed the paint with a wet paper towel (in the restroom of the Sophia Cafe above, left) and then painted it again, finally getting the “right” color but ultimately ruining the paper surface. I got in one last quick sketch of Masonic Ave. with the BART tracks and train before I had to zip down to the Albany library/community center at the end of the block for the reception. We made lots of new sketching friends and some will be joining us for our Tuesday night sketch outings we will be hosting the first Tuesday evening of each month. If you’re interested in sketching with us, please visit our Urban Sketchers blog’s Event page or join our Urban Sketcher’s Facebook Events page. The East Bay Express published a fun article about my Urban Sketchers group and the sketch event and show/reception we’re hosting today. In the article they mentioned my sketching toilet seats in the hardware store so I thought I’d bring that sketch back from the past. 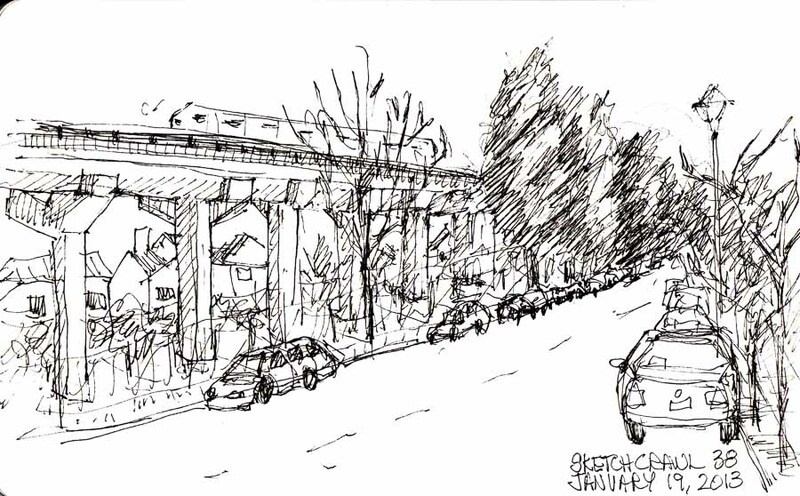 Here’s a link to the newspaper article: “Sketching the Extra-Ordinary” (PDF). 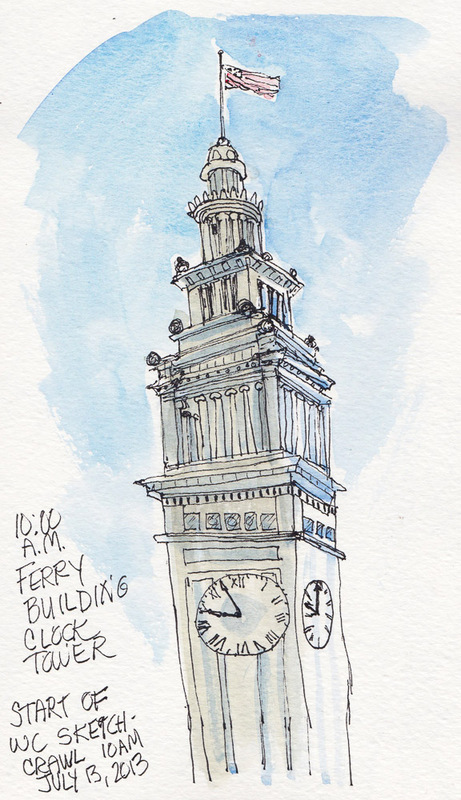 And here’s a link to the Events Page on our Urban Sketchers blog with information about the show and sketching event. We’re sketching from 12-3 on Solano Avenue in Berkeley/Albany starting at the corner of Masonic. The reception is at the Albany Library on Marin from 3-4. The exhibit of our sketches and sketching gear and journals is up all month at the library. We just sketched at the hardware store again this week but I haven’t had a chance to prepare that sketch for posting yet. Coming soon. Meanwhile gotta get ready to go. I’m so glad the weather warmed up a bit!